Aya has a family history that haunts her and makes her a target for FBI investigations, even though she’s done nothing wrong. Trip has a history that haunts him too, one where he’s accused of causing the death of his friend, a druggie who managed to get killed in a horrific car accident. Both have baggage to carry around. Both have different ways of dealing with it. Aya keeps on the run; Trip buries himself in a bottle. But they both have a shared passion for music. Aya, using a pseudonym, writes the songs that Trip performs with his band, though Trip doesn’t realize that she’s the source of his award-winning songs. They have a connection, which they cannot ignore; one that goes beyond the music that binds. 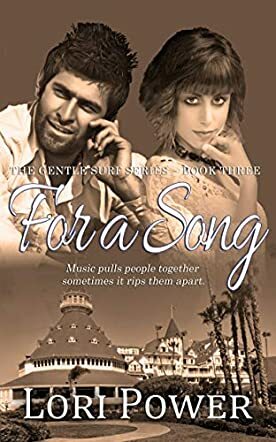 Lori Power’s romance novel, For A Song, is a compelling tale of conflict and passion, combined with a love of music that restores and rejuvenates the soul. There are two plots to this story: Aya’s and Trip’s. Both plots are developed alongside the other as the two characters come together and connect through their shared passions and needs. The setting is adequately described and the unique complications of the two characters’ backgrounds are developed with clarity and precision. Overall the plot develops reasonably well. Music is woven through the story with intricate details and song lyrics that suit the mood. Music is the thread that binds, the power that maintains the characters’ and the plot’s forward drive. This is a simple, comfortable romance story that will soothe the reader with its lyrical eloquence. For a Song: Gentle Surf, Book 3 is a contemporary romance novel written by Lori Power. Trip Vincent had decided to shoulder the blame for the devastating auto accident that claimed the life of his closest friend and musical partner, Kurt Davidson, even though he hadn’t actually been the driver. What he hadn’t counted on was the ferocity of former fans who blamed him for that death and were infuriated when the judge decided that community service was a fitting sentence. Standing before the judge and seeing the possibility of a life spent behind bars had been a terrifying experience; the traumatic experience of leaving the courthouse surrounded by angry mobs out for his blood was broken only by the chance reflection seen in the courthouse’s glass doors as he left. She stood there watching, her calm, reflective eyes gazing him, taking measure of him as it were. She was not his type, not at all. Trip went for leggy, party-girl blondes, but something in the dark gaze of that elfin waif-woman entranced and drew him. Lori Power’s contemporary romance novel, For a Song: Gentle Surf, Book 3, continues the generational stories set on California’s Coronado Island. While it’s the third in the series, For a Song can be enjoyed as a standalone as the author gives new readers insights into the preceding stories throughout her story. Power’s characters are marvelous, especially Aya Rose, with her dark history and creative genius, and Trip Vincent, the bad boy whose generous nature and loyalty has him risking imprisonment to preserve the good name of his lost friend. The plot works quite well and will be a special treat for anyone who enjoys romances featuring musicians and composers. As with the other books in the series, For a Song is beautifully written, and the author deftly transports her readers to an environment rich with the sights and sounds of the ocean. For a Song: Gentle Surf, Book 3 is most highly recommended. I enjoyed For a Song by Lori Power so much. For me, one of the biggest gifts I received in reading this book was the strong reminder of how important music, friends, and romance were to me as a young man. I forget that sometimes. I rarely listen to the radio these days. When I do, occasionally that perfect song from the past will remind me of how much music used to mean to me and how it inspired me to try to be good and try hard in all aspects of my life. It was so inspirational for not only me but my entire generation. Lori Power's writing did the same thing for me. It made me remember the power of love, the power of song, and the power of a good book. That is a pretty astonishing accomplishment in my opinion and I think others will love and appreciate this book just as much as I did. This is a simple but very powerful story. The plot is good and grows as the story progresses. There is enough mystery, suspense, and anticipation to keep the reader engaged. That is a tribute to Lori’s excellent sense of storytelling. Her timing is perfect and adds another dimension to an already well layered tale. A book will rise or fall in a love story according to how much readers relate to and like the boy and girl involved. Rest assured on that count here. Trip Vincent and Aya are as likable a couple as you could hope for. Eccentric quirks and all. At first glance, they don’t necessarily seem made for each other. But that is part of the charm of finding out who they really are. Take that journey with this odd couple. You will be glad you did. For A Song by Lori Power tells the story of the repercussions Trip Vincent faces after the death of the lead singer of their band, Kurt Davidson. Even though the jury finds Trip not guilty of Kurt’s death, Trip continuously blames himself. Only finding solace in the oblivion provided by alcohol, Trip is headed into a downward spiral that not only hurts him but those around him too, even when Aya comes into his life. Aya Rose has spent her entire life drifting around to avoid the government, as well as everyone else who tends to blame her entire family for the actions of her grandfather who had landed her name on a ‘watch-list’. Aya knew better than to get caught up in any relationship because she knew that the assassination committed by her grandfather would always put an abrupt end to anything. So she remained a nomad, a wanderer that had only let her guard down for one person; Trip Vincent. For A Song is a powerful story with a plot that twists and turns through the grieving of band members over the death of their lead singer, the media frenzy that happens after a trial, and the judgments in the court of public opinion as a 'not guilty' verdict fuels their anger. The characters are realistically portrayed so that it is easy to get caught up in their personal stories which make For A Song a very interesting read. I love how Power surprises the reader with every revelation without giving away how the story is going to unfold. I recommend For A Song by Lori Power to anyone who enjoys a romance full of suspense that they will not want to put down. For A Song is a quick read of romantic contemporary fiction, penned by author Lori Power. Continuing the Gentle Surf series with book three, this particular romance looks at the ball and chain of a dark past, where both our main characters feel drawn together, but have secrets and histories that will tear them apart. Trip Vincent is the grandson of book one’s Reginald, and although he’s been found not guilty of murdering his business partner, the finger of suspicion still points at him daily. When he finds the beautiful Aya at the hotel resort, he believes she might be his salvation, but Aya has a family disaster of her own that she’s constantly running from, whether love comes her way or not. Something that I really love about the Gentle Surf series is how every set of characters is very different from the last, and the dynamic of their romance comes about in a different way. For Trip and Aya, romance is one of many distractions that they use to hide away from the darkness that plagues them in the recent and far off past, and Aya is on a mission to reengage Trip with his musical career, whatever the cost. Her wayward charms lead him astray, making her a conflicted character to enjoy but also suspect as tensions rise. Author Lori Power has once again created a really enjoyable love plot which has even more mystery than the last, and I’d definitely recommend For a Song and the series in general to romance fans everywhere.